Have you ever thought about grooming your own Labradoodle? 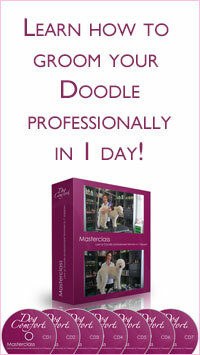 It's the perfect way to relax, spend quality time with your Doodle and improve the relationship with your Doodle. On top of that you save a lot of money on grooming costs, you get to be creative and most of all: you get to decide how you want your Doodle to look, keep it groomed the way you love (and fell in love with when you first saw your Doodle) AND you take the responsability for the well being of your Doodle in your own hands. Did I mention how satisfying it is to groom your own Doodle? And so much fun! And learning how to do it professionally is a party! This is the only website about professional Labradoodle, Golden Doodle, Water dog and Poodle mix breed coat care in the world. Especially created for Doodle and Water dog owners to give you all the information you need to keep the coat healthy, soft, fluffy, tangle free and in a cuddly, pup like look and practical lenght. Doodles are very sweet, social, smart, work diligent and in general very gentle dogs with a wonderful cuddly coat that makes your heart melt. No wonder that these dogs have become extremely popular all around the world. My name is Wanda Klomp. 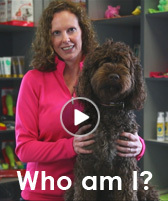 I am a life coach and specialized Labradoodle and Water dog groomer who made a business out of teaching people how to groom their dog professionally, in a natural looking way. Being the daughter of a groomer who breeds French and Italian Water dogs in the Netherlands, I was born and raised with longhaired, cuddly dogs with great characters and high maintanance coats. Water dogs are the only breeds that have similar coat structures as Labradoodles have, that are as difficult to maintain as many Doodle coats are. And the only breeds that are groomed in the same way as Doodles are groomed. But Water dogs are quite rare around the world and Doodles have not been around for long, so most groomers do not have the knowledge and experience to groom them, except the ones that have insight in different body and coat structures. Loving to work with people, eager for a real grooming challenge and wanting to help Doodles get the best care possible from their owners and help owners take grooming matters in their own hands, I decided to combine my strenghts and start a business giving grooming workshops in the Netherlands. I teach people to groom their Doodle, Water dog or Poodle mix breed professionally in a natural and casual, fluffy look. The look they fell in love with when they took their dog home as a pup. The look most Doodles lose when they go to a dog groomer. Since I started giving the workshops almost 3 years ago, I got so many enthousiastic reactions that apparently there is a great need within the Doodle and Water dog owners for information about the correct coat maintenance. Doodle Comfort gives you all the information you have been searching for, so you can learn all about the coat maintenance of your beloved dog. 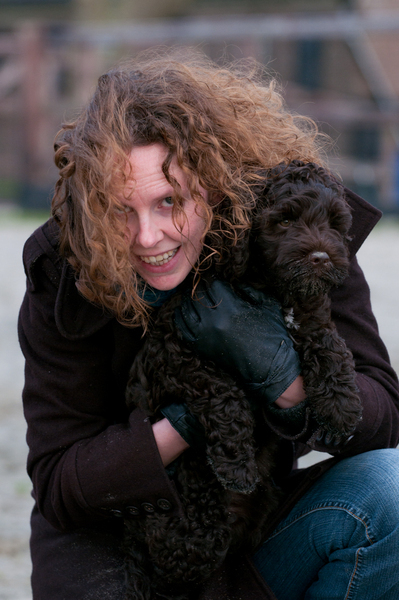 All through the website there are photo's of Doodle owners who joined my puppy habituation and/or grooming workshops. Let them inspire and enthousiast you and perhaps we will meet in the future. Sign up for my newsletter and get my E-Book "6 Secrets to keeping your Labradoodle tangle free!" for free!